Story Supply Co. started on Kickstarter in the fall of 2015 with the book I’m reviewing today, the Pocket Staple notebook. The idea is to do a one-for-one model, donating books to the various 826 organizations around the country, as well as others. Andy from Woodclinched called it the “TOMS of the stationery world”. Since launching the Pocket Staple notebook, they’ve done a few versions, including a book for CW Pencils. All are available on their website, Story Supply Co. Believe it or not, there was an opening in this area of the market: Made in the USA, fountain pen friendly, staple-bound books. Field Notes really isn’t very fountain pen friendly, Write Notepads paper is great, but some people can’t get over the perfect binding. The Word. notebook is more of a notebook for their system, the paper isn’t great, and not available in different rulings, except they did do a dot grid release. Most of the good-for-fountain-pen pocket notebooks with this binding are made in other countries...not a deal-breaker for me, but if and when you can buy from small manufacturers in your own country, it's a good thing. 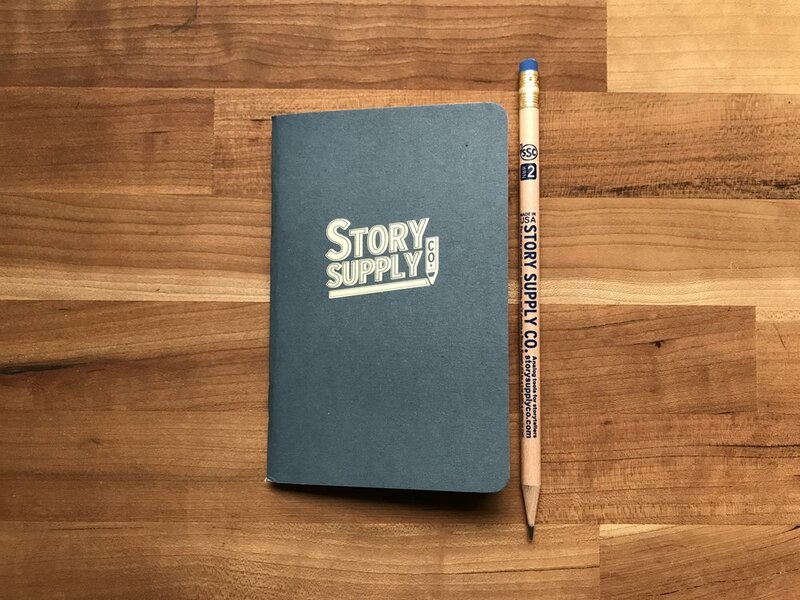 So if you’re like me, a fan of both Field Notes and Write Notepads and wish those two would just get together already and make a baby…Story Supply Co is for you. The 70# Cougar Natural smooth paper is the reason for being here. 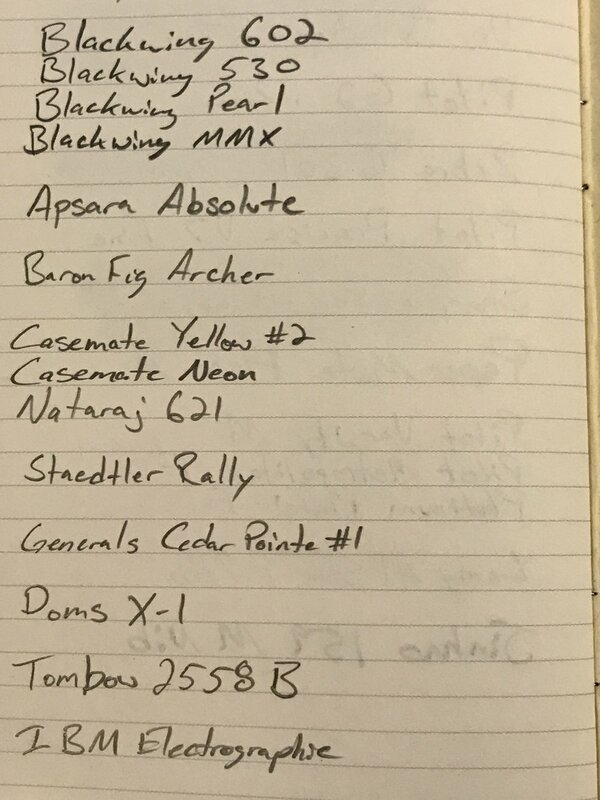 This is the same paper in the Field Notes Byline…it’s creamy, it’s good for writing with fountain pens (though I wouldn’t practice your large nib, sweeping calligraphy on it), and it takes pencil well. The difference between something like Baron Fig paper and this is that it’s not nearly as toothy, so when using extra fine and fine nibs, I don’t have to worry about getting hung up on the tooth at all. Other books have shuttered at my very wet Jinhao 159 Medium nib, but the SSC Pocket Staple took it very well. It's available in lined, graph, or blank. Of course, I chose lined. Pen test, a few swabs of fountain pen ink. Opposite side of the swabs. You can see the wet Jinhao coming through, but generally pretty good performance. But this is a pencil-focused blog, so how does it treat pencil? Very well! Often papers that are “great for fountain pens” suffer a bit in the pencil department, in my book. It’s usually too smooth (looking at you, Rhodia). Most pencils looked true-to-grade, where they can look a bit lighter on glassy paper and a bit darker on toothy paper. The creamy color of the paper does lend a bit of a stone brown / gray tint to some of the lighter grades. The cover is a really cool 100# Kraft-tone from French Paper with a blast of navy printed all over the cover. The whole thing is held together by 2 copper staples. There's a little tooth to the cover, so the resulting look reminds me of denim. It has held up well to the daily abuse of my back pocket for about a week now. Just like denim, it's wearing in really well, fraying in all the places that fit perfectly with my shape. 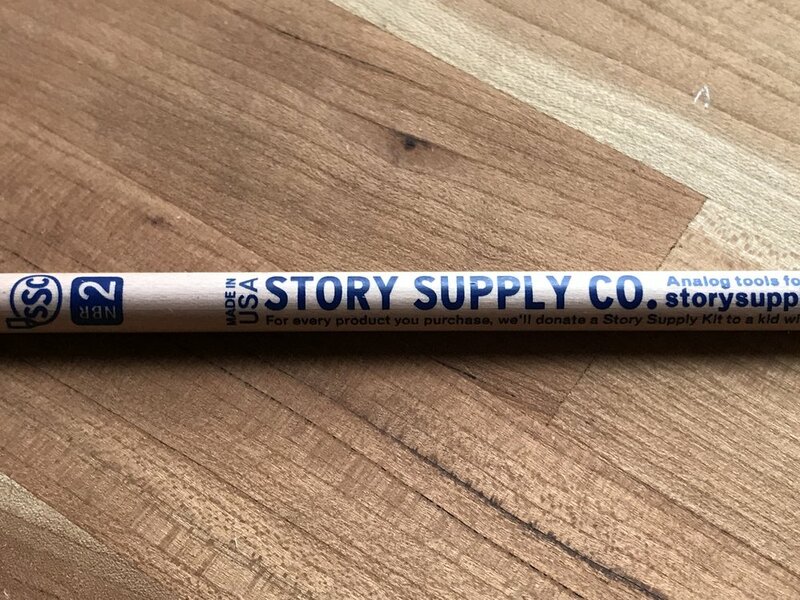 The Story Supply Co. pencil is fun. It's round! It's listed as a #2, but writes fairly dark, closer to the #1 or B grade. It's Musgrave made, but the eraser isn't complete junk like some of the Musgrave pencils...it reminds me of the Golden Bear eraser a little bit. It's a natural pencil, screen printed, but has a thin clear lacquer on it. You can see the basswood coming through, but it doesn't pick up your hand gunk and start to get a patina like the Field Notes pencil or the General's Cedar Pointe. The only two things I would change is it would be nice if it were incense cedar and if it didn't have the thin clear lacquer. I like the patina my disgusting mitts make on a natural pencil. The print is a dark blue that matches the eraser and the notebook fairly well. All around, it's one of the better Musgrave-made promotional pencils around. I've approached this notebook and other pocket notebooks in the past with a "why does this exist?" attitude, never stopping to ask myself "why not?" There are thousands of different pencil brands in the world. There are just as many pen manufacturers. And I never question that. The pocket notebook is arguably more personal than the pencil. Of course there should be more brands around! There are 20 coffee shop "brands" in my town, I've not gone to all of them, but I do shop around a little. I never complain about another one opening up, but instead think "ooh, I wonder what they've got in there..." It is my limited view that I've had to change when it comes to this segment of the stationery world. Instead of dismissing things out of hand and sight unseen, I need to take things with the open-minded innocence that I did when I first discovered this love. Thanks to the countless people who have reminded me of that by having that open-mindedness themselves. And thanks to Story Supply Co for making a great book to prove me wrong. Available from Story Supply Co. $10. Blank, graph, or lined. Use this link to get 40% off. FULL DISCLOSURE: The 40% off referral link is not a sponsorship situation and is just a promotion they sent to all their existing customers to spread the love to their friends. Depending on when you're reading this, it may or may not still be valid, but still works as of press time. I paid for these notebooks and pencils in full.